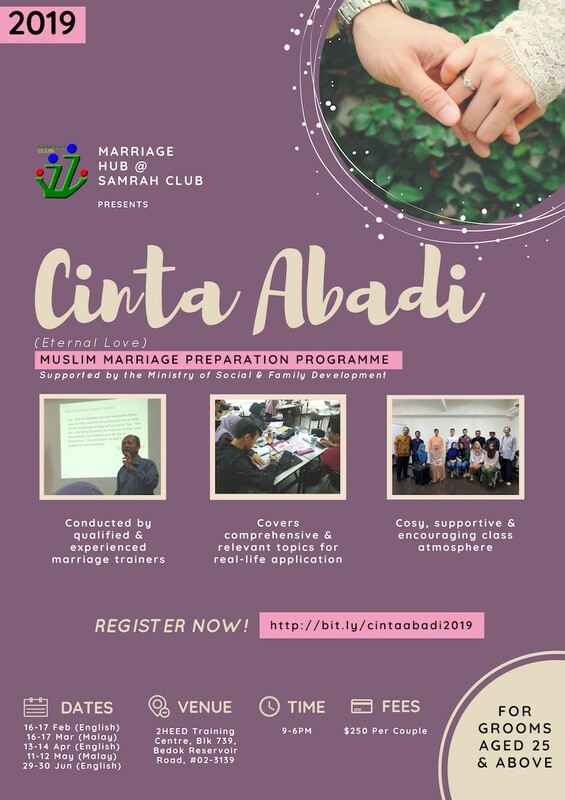 We are glad to announce that 2019 sessions for our Cinta Abadi (Eternal Love) Marriage Preparation Programme (MPP) are set! WHAT IS CINTA ABADI MPP ABOUT? Marriage does not come with manuals but with the right knowledge, you can make it work. Join over 7000 couples who have found our programme beneficial for their marriages! Any Muslim couples who are planning for marriage. However, grooms MUST be 25 year old and above to qualify. 3) Receive tips and know-how to meet challenges together. 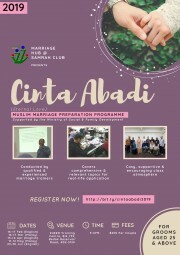 Our facilitators are qualified and experienced marriage trainers who have been involved in marriage preparation workshops (also known as Kursus Rumahtangga) for many years. HOW LONG IS THE MPP? The MPP is conducted over 2-days. Please contact Ms Zuriati @ 94217919 or samrah.info@gmail.com for enquiries. You can also PM our FB page! Please contact Ms Zuriati @ 94217919 or samrah.info@gmail.com for enquiries.